White Gold Wedding Bands and Antique Wedding Rings, made of white Gold or Platinum, will enhance the beauty of yours truly Diamond. A return to color "white" jewelry has been one of biggest wedding jewelry fashion trends since the Art Deco Jewelry fashion trend that demanded Platinum & White Gold Jewelry. You see, buyers of gold coins in this recession, are not the only gold investors on the increase. Sales of platinum and white gold vintage diamond engagement rings have soared to new heights previously not seen for more than 35 years! The color White is a perennial favorite metal for the bride and people in love, and the reason behind it is quite simple: White gold wedding bands will enhance the Whiteness of all Antique diamonds and Antique diamonds will always sparkle blood-free. Platinum was the preferred metal in the Art Deco period but became almost unavailable at the start of the Second world war. Then from the 1940s onwards, White gold replaced Platinum and remained the best selling metal for wedding bands. Platinum is more than twice as durable as gold and more expensive. Antique Jewelry Investors, with their fingers on the pulse and their eye on the gold fix, have also noticed a scramble for old white gold. Here is one of the reasons: a jeweler recently mentioned to me, that some new white gold rings today are actually rhodium plated yellow gold rings! The rhodium plating however will generally only last on these new rings for around 5 years. Responsible jewelers are not into rhodium plating anymore. Read Comment by ARGEN HERE. Metal choices for Antique wedding bands are usually traditional yellow gold or platinum. Platinum wedding bands were first made in the early 1900's. When looking for antique white gold wedding bands online, you often run across antique style wedding rings, which refers to a new ring manufactured to look like an antique wedding ring. There are wholesale jewelry manufacturing companies selling the popular reproduction or antique style engagement rings with intricate white gold settings. These rings, are purchased by jewelers who add wholesale diamonds or colored stones. 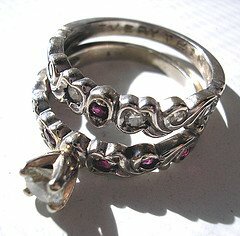 Antique style wedding rings are sometimes misrepresented by less reputable jewelers as authentic antique rings. When it comes to choosing an antique wedding ring, symbolic of future marital bliss, ask questions Before you furnish the jewelry retailer's cash register. A diamond is forever in both Antique and Modern diamond rings, but the Antique Diamonds that you find in Antique diamond jewelry are rather special. It's in the the old fashioned Cut and the diamond mines from where these antique diamonds were discovered. Most of these old diamond mines are no longer in operation. The rarity of an antique cut diamond like an antique piece of jewelry is normally determined by its visibility (or lack thereof) in the marketplace. The old diamonds you see in Antique diamond engagement rings were cut by hand, unlike their modern diamond cut descendants. Facts about diamonds tell us, that one of the earliest diamond cuts, was the Old-Mine Cut which can trace its history back to the 16th century! The crown of the old-mine cut diamond (the top) will look like a square shape. A rose cut is another antique diamond cut and and was a popular cut for garnets not only diamonds. Looking down onto the top of the gemstone, the rose cut resembles a rose bud and is flat underneath. Two other types of old diamond cuts are the old european cut diamonds and the single cut diamonds. Remember to examine the antique diamond Settings to make sure the diamonds are secure. The reason for the small finger ring sizes is simple. Women and their fingers were smaller 100 years ago. Resizing to a common ring size of 7 US or greater is near impossible if the antique ring has a decorative band. When investing in white gold wedding bands choose a wedding band that you will wear and enjoy. Consider the past history of these special white gold wedding bands as well as the memories you can create for yourself in the future andfor future generations, which you might also create :-) and then pass down, in the great circle of time.